One of the most common questions I received when working retail in Minnesota was, “Can this wine age?”. For whatever reason, Americans have an obsession with aging their wines. Maybe it’s the youthfulness of the nation? Maybe it’s our fascination with ancient European history? Or maybe, it’s just the dream that one day we’ll wake up to a forgotten 10 year old bottle that has tripled in value leading to an easy retirement. Either way it’s an obsession. I can’t say that I have completely shed this cultural baggage myself. I do appreciate the beauty and subtly of an aged wine. With the opportunity to taste older bottles on a more regular basis, I find I enjoy a bit of age on my wines. Sure I still love the fresh youthful exuberance of a recently bottled Moscatel, with a hint of sparkle on a summer’s day; but in the end, I’ll reach for the wine that has sat in repose to take on a mature sheen more often than not. The hardest part of aging a wine, is once its age begins to show, when do you open it? I have a mild obsession with aged white wines, and especially those I’m told not to age. Albariño being one of them, a wine that producers suggest I hold onto, while retailers and wine educators preach the “drink early and often” philosophy. 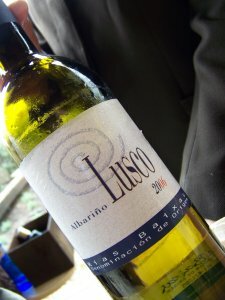 With a bit of stubborn determination, I held onto a 2006 Lusco Albariño for both experimentation sake and to try an aged white at home as opposed to the winery’s cellar. The verdict? Yum! 4 years aging for a Rias Baixas Albariño is a travesty to some, and for others, a complete joy. The wine is drinkable. No, it is better than that! It is a lovely wine with subtle elegance that brings a smile to my face as I sit here sipping it. Subtle being key, though not without its charm. Rich acidity is still showing a proud face as the palate displays minerally lemons and layered fruit. Oxidized, yes, but only in the best way, and not overly so. As Gabriella’s article stated, some wine faults can be benefits. The answer to the question, “Will this age,” is simple, do you want it to? I’ve had 150 year old port wines that while faded and far from exquisite, were still beautiful glances at history. I’ve also enjoyed wines fresh from the fermentation tank, still holding onto their vinous umbilical cords. Both were enjoyed for very different reasons. We love Albariño, both for its youthful vibrancy and for its ability to show a new and beautiful profile when coaxed appropriately. Tell us what you prefer in the comments below!